UK Brexit Secretary Dominic Raab will resume talks with EU Brexit negotiator Michel Barnier on Tuesday. Both sides need to agree on the Irish “backstop” for there to be any final deal. The “backstop” is the fallback option for protecting the Irish border should the UK fail to come up with a workable solution. But there are big obstacles in the way of an agreement. LONDON – Brexit Secretary Dominic Raab heads to Brussels, Belgium today in a fresh bid to sell the UK’s Brexit plan to the European Union amid increasing concern over the prospect of no deal. 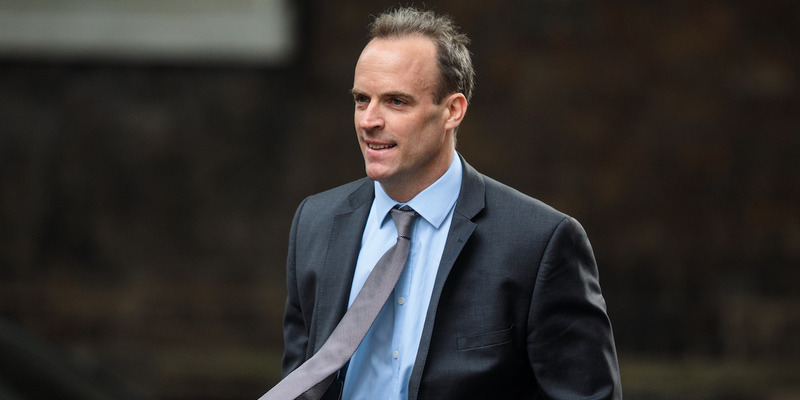 Raab will meet with Michel Barnier, the EU’s chief Brexit negotiator on Tuesday and Wednesday, before delivering a speech on the state of Brexit talks in London on Thursday. Raab and the UK negotiating team have a big task on their hands. The EU has already publicly rejected big chunks of the Brexit blueprint laid out in Theresa May’s so-called Chequers proposals earlier this summer, and time is running out to find a deal. Here are the big issues which need to be resolved. In order to avoid a no deal Brexit, both sides must find enough common ground to sign the Withdrawal Agreement, which lays out the terms of the UK’s departure. If there isn’t a Withdrawal Agreement, the UK won’t get a transition period. Without a transition, it will crash out of the EU without a deal in March next year. That is the chaotic situation most MPs wish to avoid. So what’s stopping the UK from signing up to the Withdrawal Agreement? 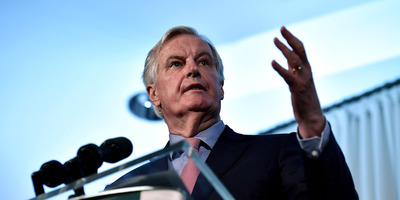 The EU wants the UK to agree to a “backstop” – a fallback option, in effect – which would fully preserve the open border on the island of Ireland should future trade negotiations fail to produce a means of doing so. The proposal is designed to ensure that no border emerges between Northern Ireland and Ireland: any new infrastructure would break the terms of the Good Friday Agreement and damage both economies. The EU’s backstop proposal involves Northern Ireland staying within the EU’s customs union and the single market for goods. But Theresa May – despite agreeing to the backstop in December – is adamant that this arrangement is unacceptable because it would create a border in the Irish Sea between Northern Ireland and the rest of the UK. In Belfast earlier this year, she warned that signing up to the backstop would risk full-blown constitutional rupture. “The economic and constitutional dislocation of a formal ‘third country’ customs border within our own country is something I will never accept and I believe no British Prime Minister could ever accept,” she said. And here’s where things become more complicated. The backstop is only an emergency measure. It would take effect if the UK could not come up with an alternative plan which avoids the need for checks at the Irish border. For that reason, the UK wants to talk about detailed customs proposals which would be part of the future UK-EU relationship. If May can persuade the EU to sign up to its plans for the future relationship, it would avoid the need for a backstop altogether. However, there are two big problems with that. The second, more fundamental problem is that the EU doesn’t want to talk about future arrangements before it the backstop is sorted. The backstop, it says, is a divorce issue, and part of the legally binding Withdrawal Agreement. It says Article 50 – and the Withdrawal Agreement – is a “divorce” deal. It can’t legally be used as the basis to talk about the UK’s future trading relationship. So both sides are at an impasse – and time is running out to break it. Underpinning May’s thinking in negotiations is likely to be the trickiest question of all: How can she secure a politically and legally workable Withdrawal Agreement in Brussels which receives support from a majority of MPs in Westminster? It would also see the Conservatives lose the support of the pro-Brexit, pro-Unionist DUP party, upon whose votes May relies to support her wafer-thin working majority in the House of Commons. When Brexit talks got underway last year, both sides said they wanted to have a deal in place by the European Council’s October summit. Given that there has been minimal progress on the thorny issue of Northern Ireland this summer, both sides have a lot of work to do in the eight weeks that remain until that summit. There is a strong possibility of talks going beyond the October summit and into the New year. However, both the Westminster and European parliaments need time to sign off any final deal before the UK officially departs in March 2019. The UK government could request an extension to Article 50 process in order to secure more negotiating time. Whether the EU would agree to this is doubtful. Sources in Brussels have told Business Insider that the EU would only consider delaying Brexit if it was to make time for a democratic process – i.e a second referendum. 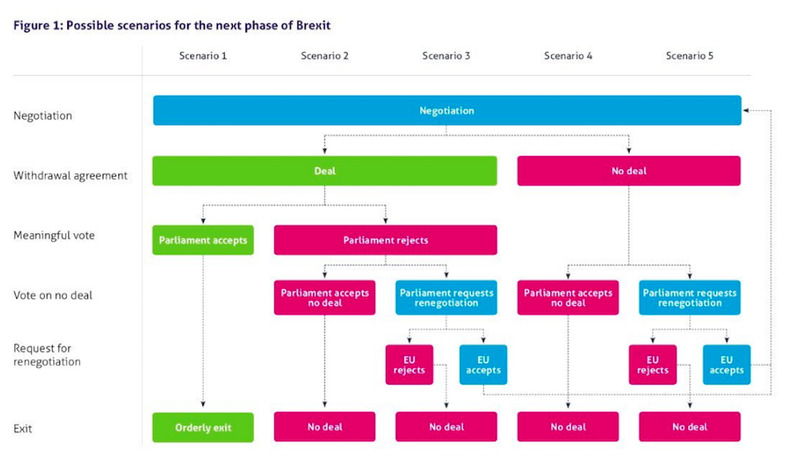 The Institute For Government thinktank this week produced a chart illustrating the various scenarios that could unfold in Brexit talks, and why a no deal Brexit is a major possibility.